"We don't die on request." Remember the old saying that the moon is made of cheese? As we move into the latter part of the second season of Space: 1999, there are a couple of things the audience has to accept in order to fully appreciate the show: the first is the number of goofy alien monsters they are about to see; the second is the abandonment of all scientific basis for the scripts. Sure, there are lots of buzz words thrown around, but their applications are laughable. The writing also allows the crew, especially Koenig, to deduce complex situations at the drop of a hat, which while allowing neat storylines, stretches any credibility to the extremes. Having firmly established that this is now a space fantasy, action-adventure, and not a science fiction show, its contents will be a lot more enjoyable. The actors have definitely settled into their roles, and seem much more natural and relaxed. There are still places where the scripts and direction take the players out of character, but for the most part everyone has a predictable demeanor, and are more personable. There is a definite bonding between Koenig and Dr. Russell, with Tony and Maya having an ongoing relationship as well. The sets and special effects are more elaborate and varied, and the camera work is more adventurous, using wide shots, high or low angles, or unusual positioning to heighten whatever mood is being set. As for the stories, this collection's high point is the closing, two part Bringers of Wonder, which elevates the grade on the set from some of the more lackluster installments, The Beta Cloud and Space Warp, both penned by producer Fred Freibergher under the pseudonym Charles Woodgrove. The ideas behind these episodes aren't badt, but some get dragged down by the production choices and execution. The concepts are generally interesting, but I'll admit many of them went over better when I first saw the series in the 1970s, when things like space warps, antimatter or telepathy were rarer subjects. Despite some of its failings, this is still a series that I had to own, and the restoration of the second season has done wonders for the presentation. The moon may be made of cheese, but this is good cheese, with plenty of excitement and style. A strange cloud is causing people to collapse and equipment to malfunction. Most of the moon's personnel has succumbed and become incapacitated, with only a skeleton crew immune to the systems. A reconnoissance Eagle miraculously reappears after investigating The Beta Cloud, but there are no life signs registering on board. It is soon discovered that a hostile alien lifeform has arrived to retrieve Alpha's life support system, but with the commander out of commission, it's up to Tony and Maya to stop it before it's too late. Aside from a bit of romance between Maya and Tony, this is a pretty basic "guy in a lame monster suit chasing around Alpha" episode, with David Prowse (Darth Vader of Star Wars) as the monster. Alpha comes across Sunim, an apparently uninhabited M-class planet, which while verdant with plants, shows no other signs of life. Consul Shermeen Williams (Lynn Frederick), a young botanist is enlisted by Vindros, a disembodied spirit from an antimatter universe, to assist in his plans. When she joins the away team, she retrieves an article from a well-guarded fortress, one that will allow Vindros and his people to cross over from their world, but the device requires an even exchange in A Matter of Balance. This had its moments, and more fun poking at Tony's brewing skills. While Koenig and Tony are investigating a derelict spacecraft, the moon encounters a Space Warp sending it light years across the universe, leaving Koenig's Eagle behind. Maya is running a mysterious fever, and having nightmares of her home planet's destruction. Her condition is causing her to lose molecular cohesion, but when she transforms into a hideous alien and begins attacking personnel, Alan gives the order to shoot to kill. This episode features some great special effects shots inside the Eagle hanger, but falls apart in the script department. In the second part, Koenig has to convince Maya and Helena that has hasn't lost his marbles, and that the whole base is under the control of an alien race trying to re-energize themselves with Alpha's nuclear waste—by blowing up the moon. Image Transfer Review: If only all television programming could look this good. Like the previous four discs in the second season, this set looks amazing, due to the restoration work. The image is extremely clean, with bright, vibrant colors, excellent detail, good contrast and few source defects. There is little sign of aliasing or any compression issues. Another "stellar" presentation. Audio Transfer Review: Mono audio is presented well, with a full, even tone. Technical problems such as hiss or distortion were nonexistent, and there was no excess sibilance noted. There were a few minor volume inconsistencies on the opening credits, but other than that, a solid presentation. Extras Review: Disc 13 contains three trailers, plus US and UK promo trailers hosted by Martin Landau and Barbara Bain. An 18-image pre-production gallery features concept drawings, while the 19-image photo gallery shows behind the scenes shots from the disc's episodes, including an out of costume David Prowse. A seven screen essay on Moonbase Alpha rounds out the disc's contents. Disc 14 houses a 2-1/2 minute BBC segment, showing some of the special effects and model work used on the series. A production image gallery featuring behind-the-scenes stills, and an photo gallery with screen grabs from the three episodes on the disc are included, along with trailers for the two features created by combining episodes for release to markets not broadcasting the series: Destination Moonbase Alpha (Bringers of Wonder Parts 1&2)and Alien Attack (the first season's Breakaway and Wargames). These appear to feature footage not seen in the episodes themselves. Set number seven is housed in a pale purple box, with the individual cases featuring identical artwork. A synopsis for each episode is on the back of both cases and a single sided ad for other A&E box sets is the insert. 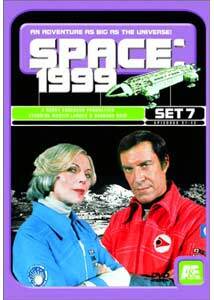 Despite some rather campy alien costume designs and a couple of less than spectacular scripts, Space: 1999 continues to entertain with its own brand of space adventure. The sets and special effects are excellent for their time, and the stories are fun and generally paced well. A&E has done a nice job with the second season; the restoration here is marvelous, and the behind-the-scenes extras are a welcome addition. For fans of the series this is a real treat. Recommended.